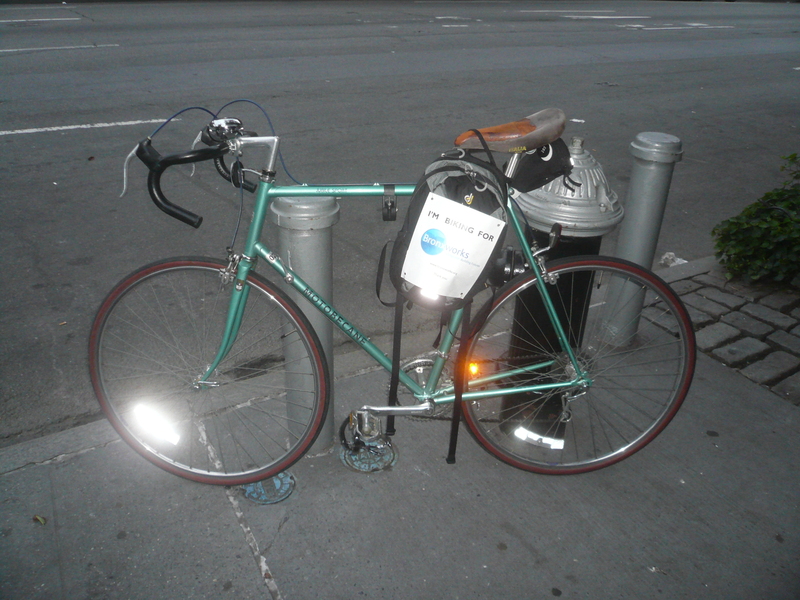 Last year I rode in the 2011 Five Borough Bike Tour and blogged about it. The photo service that took pictures of riders got three very good pictures of me, which I purchased and published on my Picasa page, suitable for blackmailing me in the future :-). I rode again in 2012 with the BronxWorks team (Tamara [unofficial captain], Jane, Declan, Julio, Josh, Cristina, and me). We raised money for BronxWorks, a wonderful settlement house in the Bronx that runs programs to support homeless families with children. Several of the riders on the BronxWorks team volunteer in programs at the organization’s facilities in the Bronx. All of the riders raised money to support the organization’s activities, including me. (left to right) Marc, Tamara, Jane, Declan, Julio, Josh, and Cristina. This year’s ride was on Sunday 6 May 2012. The weather was cool and overcast in the morning, clearing and warming by mid-afternoon when I got home. Conditions were perfect for the ride. Cool enough to help riders dissipate the heat of the exertion, while clear and dry to keep the riders safe during the ride. Unofficial captain Tamara rendezvoused with teammates Julio, Jane, and me in the Upper West Side at 6:20 AM. Registration materials this year had to be picked up in person at South Street Seaport, something that Tamara had organized, so she brought Jane and me our identification bibs and rider numbers, which we donned on the street corner. We then rode down to the starting point in TriBeCa, arriving at about 7:10 AM for the 7:45 AM start. Starting ceremonies began at about 7:30 AM with a series of dignitaries addressing the crowd. The starting gun, well, actually the starting bursts of flame, came at 7:45 sharp and we were off. One of the benefits of riding for an organized charity is the starting position. The over-30,000 riders in the Five Borough Bike Tour are organized into several tiers. The VIP tier of several hundred riders starts at the very front. Right behind the VIP tier is the charity group, another several hundred riders whose sponsoring organization, in our case BronxWorks, has arranged for them to start next. After that is the vast majority of riders. Last year there were numerous points on the tour where traffic bottlenecked and we were forced to pause for long periods of time, standing still or walking our bikes. Last year’s bottlenecks included the first mile or two after the start, the mile of Sixth Avenue before we entered Central Park, and somewhere on the BQE where construction forced the route onto a narrow ramp. I know that one of my friends who rode last year in a non-charity group, spent over an hour after the starting gun before he got moving. This year, by contrast, the bike tour operators implemented a collection of improvements to the starting process and the route that resulted in essentially no bottlenecks anywhere. As a result our team finished fifteen minutes ahead of our finishing time from last year, despite two equipment mishaps. The first mishap affected me in Central Park. As we started a long descent I decided to shift from the low range to the high range on my 31-year-old Motobecane Jubile Sport. The cable connecting the shift lever to the derailleur slipped loose and my chain popped off the gear and hung up around the axle of the crankshaft. I pulled over and lost five minutes getting things sorted out. I was soon back on the road. I could still pedal fine, and I could shift with the rear derailleur, so I had a fine six-speed bike on which I could easily finish the ride. At the same time I noticed a little vibration in my rear wheel that signaled that some of the spokes were loosening, a more alarming situation. At the BronxWorks rendezvous for the 2012 Five Boro Bike Tour, Marc’s 1981 Motobecane Jubile Sport. Mine is a steel-framed road bike that I bought new in 1981 or 1982 and that I still ride to commute to work. It’s a beautiful bike with gorgeous lines made possible by its steel construction and a lovely aquamarine paint job. The old Motobecane company was a French maker of bicycles and motorscooters that went bankrupt in 1981, about the time that I bought the bike. Their market niche in France was low-end, but in the US they were a premium brand catering to the upper end of the cycling crowd. The Jubile Sport that I bought in 1981 (or 1982) when I was a grad student was a midrange road bike for the time. It had very good components, though there were better ones, and a reasonably light frame, though there were lighter ones. Today the bike is completely dated, but it remains an eye-catcher with its beautiful lines and color. After crossing the Queensboro Bridge (aka the 59th Street Bridge aka the Ed Koch Bridge) I rejoined the team just outside the Astoria rest stop. There one of my teammates, Declan, executed a miraculous set of repairs to my bike, restoring the front derailleur to functionality and sorting out the loose spokes in my rear wheel. The result was a smoothly functioning bike that allowed me to finish my ride comfortably and without anxiety. After the rest stop we resumed and rode across Queens and Brooklyn. Along the way somewhere in Brooklyn Christina ran over some debris on the road and got a flat on her bike’s rear wheel. The whole BronxWorks team stopped and, working together, made quick work of changing out the inner tube and reinflating the tire. We were spinning down the road again within five minutes of the flat. There was something stimulating about addressing the flat as a team, even though most of us did nothing more than stand by watch the action. The rest of the ride to the Verrazano-Narrows Bridge and across to Staten Island, where the ride ended, was uneventful. We took a break at the festival grounds at the end of the route and ate a box lunch provided as part of the charity rider package. We then rode another three or four miles to the Staten Island Ferry terminus and boarded the John F. Kennedy, on which we rode back to Manhattan. This year, rather than carrying our bikes on to the subway, we decided to ride up the west side bike path. This was a bit confusing in the early stages, since the bike path is a bit incomplete and confusing near Battery Park, but we were able to navigate it. The final fifteen minutes of the ride were, as a result, the same as my ride on the days when I commute to work by bicycle, which was curiously comforting. Tamara, our unofficial team captain, used a rather cool GPS device to track the ride and distributed a wonderful map to the riders this morning. I captured it in Google Maps and include it here. All in all, it was a lot of fun. It was work, but except for the first seconds after my front derailleur mishap, I never felt like I was unlikely to be able to finish and when I was done I was very tired but quite content that I’d done a good thing. I would like particularly to thank my sixteen incredibly generous donors (David, Ron, Igor, Michael, William, Maxine, Trevor, Hal, Steve, Jon, Stu, Satish, David, Silvia, Amy, and Lucy). Thanks to you, homeless Bronx children and their families will have access to a range of wonderful supportive programs. Next Next post: Patch Management – Bits, Bad Guys, and Bucks!